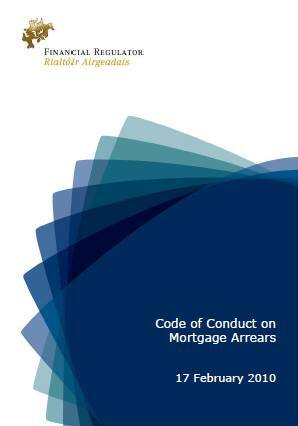 The Financial Regulator recently brought out a new code of conduct for mortgage arrears, the full length eight page document is here. It applies to consumers only, and only in respect of their principle private residence in the state. The code should be treated as an extension of the Consumer Protection Code. Avoiding an arrears problem: Once arrears arise the lender must promptly communicate with the borrower to establish grounds for same. 2. Any excess interest (as a rate or amount) that may continue to be charged and the basis of how it is charged, any charges payable and the basis of them. 3. Advice regarding the consequences of failing to respond – namely the risk of legal proceedings with an estimate of costs to the borrower of same. If arrears persis the lenders has the right to enforce the agreement (repossess the property) however, they must wait 12 months from the time arrears first arose before applying to the courts (civil bill). The lender must notify the borrower when it commences legal action for repossession. 4. Changing the type of mortgage if it results in reduced payments. 5. Capitalising the arrears and interest if it results in repayment capacity and if sufficient equity exists. The borrower must be advised to take appropriate independent advice. Lenders must give borrowers clear explanations in writing along with costs/charges that may arise, they must continue to monitor the situation, the borrower must have a relevant contact in the lenders firm. Where appropriate the lender should refer the borrower to MABS, at the borrowers request and with their consent the lender can liase with a nominated third party. the borrower should be made aware of all alternatives, trading down, voluntary sale, or refinancing elsewhere. Repossession proceedings: A lender must exhaust every alternative before seeking reposseession, an abscence of engagement is considered grounds for this. It may also come about via voluntary possession, by the borrower notifying the lender, or via court order. Even in a repossession case the lender must maintain contact with the borrower or their nominated representative. If agreement can be made the lender must enter talks and put a hold on proceedings if an agreed regular payment is maintained. The lender let the borrower know that no matter how the property is repossessed and disposed of, the borrower will remain liable for the outstanding debt, including any accrued interest, charges, legal, selling and other related costs, if this is the case. Retention and Production of Documents: A lender must keep and maintain adequate records of all the steps taken, and all of the considerations and assessments required by this Code, and must produce all such records to the Financial Regulator upon request.